We can break equipment too! One of my colleagues, Matthew Betts, who has done Arctic work for years, is currently excavating a large shell midden at Port Joli, Nova Scotia. He also has a project blog, and in a recent post on trowels, there was news of the sad demise of a Marshalltown trowel. Marshalltowns are great trowels, and I’ve never seen one break the way this one did. They usually wind up being discarded after being resharpened so many times they are nubs. 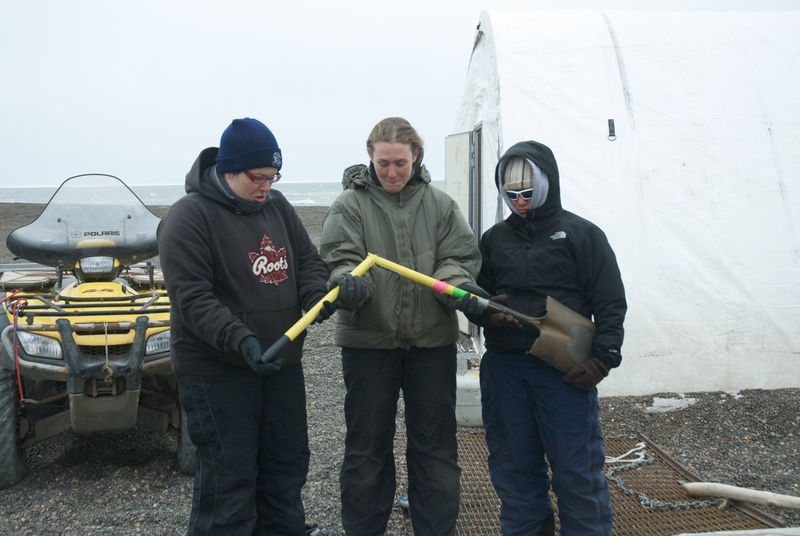 Laura, Jenny and Rochelle with the remains of the late shovel. To be fair, I’ve seen these things break before, but it involved heavy equipment. We’re not sure what happened with this one. These are great shovels (maybe only archaeologists and landscapers can get so enthusiastic about shovels), but have to be special ordered to Barrow, which is sometimes a very convoluted process. That is why it has the pink and green duct tape rings on the handle. That way, we can recognize our shovels when they get “borrowed” and borrow them back. Posted on July 20, 2010 July 18, 2010 by Anne JensenPosted in field, UncategorizedTagged Archaeology, equipment. But I am left, once again, wondering what you guys could have done (other than run over the handle with your truck?) to break a solid hardwood shovel handle. And a new one to boot! Are you guys finished for the season? Actually, it’s a fiberglass handle, which are lighter, stronger and better in the rain/snow/salt air than wood handles. It’s actually at least 3 years old! I don’t know what happened. I don’t think it got run over, and in the loose gravel at Nuvuk, that probably wouldn’t break a shovel anyway. Best guess is someone (maybe a weekend visitor) used it to pry something. We are done. I’m just digging out from the mess with me in the field & Glenn in DC for 10 days :-).